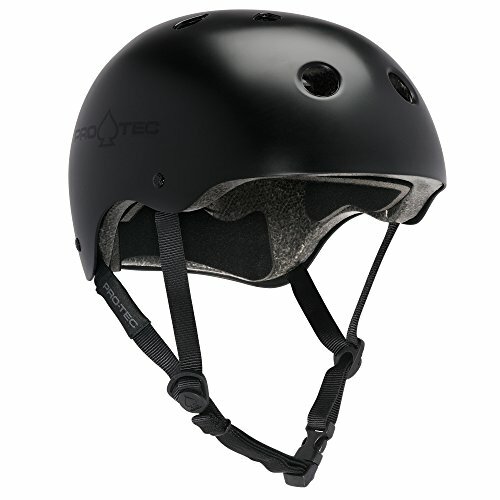 Built for rigorous skateboarding and biking, the CPSC-certified Classic helmet from PROTEC Original is equipped with an EPS foam liner for protection while attacking skateparks, halfpipes, or even your backyard pool. The CPSC-certified Classic features a tough ABS helmet exterior shell that's complemented by a stiff EPS foam liner. It also includes 11 large vent openings to help keep your head cool during intense use, soft nylon webbed straps that are easy to adjust, comfortable interior padding, and stainless steel rivets. This CPSC-certified Classic helmet meets CPSC, ASTM, CE, and AS/NZS certifications. Designed for skateboarding, bicycling, and a broad range of action sports. Founded in 1973, PROTEC Original continues to deliver the very best in modern protective equipment with a broad range of impact technology for a variety of action sports -- skateboarding, snow sports, bicycling, water sports, and more. If you have any questions about this product by PROTEC Original, contact us by completing and submitting the form below. If you are looking for a specif part number, please include it with your message.